The word violence generally conveys the impression of some form of physical aggression. But, the spiritual definition of violence is much broader. It says that violence begins from the moment you have a thought about hurting another living being. Violence is something that is completely the opposite of peace, whether it is internal or external peace. Therefore, to maintain peace, one should maintain complete non-violence. Param Pujya Dada Bhagwan states the definition of non-violence is, “To maintain the awareness of not hurting any living being, even to the slightest degree, through one’s mind, speech, and actions.” When this principle remains firm in your belief and awareness then you will be able to progress spiritually. This constant awareness can be attained after Self Realization and with the blessings of the Gnani Purush. Many people also wonder how being a non-vegetarian is considered a form of violence. Param Pujya Dadashri responds, “The general rule is that you cannot destroy what you cannot create.” From this, we can understand that we should not take any living beings’ life because we cannot bring them back to life. 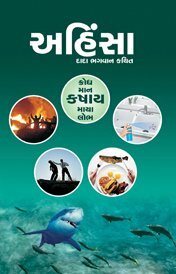 You can learn more about violence (himsa) and non-violence (ahimsa), from the gross to the subtlest levels as exposed in the book, “Non-Violence”. 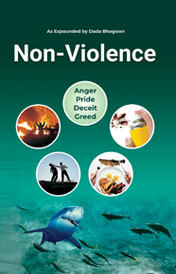 It will serve as a useful guide for those who want to practice non-violence (ahimsa) and desire liberation. The definition of ahimsa is: to maintain the awareness to not hurt any living being, even in the slightest degree, through your mind, speech and actions. "Face all violence with non-violence." If someone uses the weapon of violence, you should use the 'weapon' of non-violence against him. Only this approach will lead to happiness. Violence only stops with non-violence. On the one hand people pray to the Lord while on the other, they continue to hurt the very beings within which the Lord resides. To cause someone mental distress, to hurt him, cheat, betray or steal from him is all raudradhyan (adverse internal meditation that hurts others), the consequence of which will be a life in hell. Ahimsa means to not have a single negative thought about anyone, not even for one's own enemies. A non-violent person will even think about the physical well-being and salvation of his own enemy. Kashaya is the ultimate violence and that is why the Lord has said that first and foremost, one should not have any kashaya. This type of violence is called self-violence or intent-violence (bhaav-himsa). There is no greater violence than the kashaya done against other human beings. Show me anyone that does not do this. Those who do no kashaya at home practice true ahimsa. If a person were to resolve in his mind that under no circumstances does he want to kill any life-form, then he will not be instrumental in causing the death of any life-form. 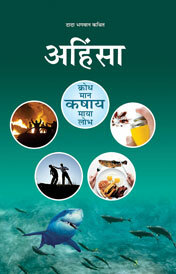 Protecting life from fear (Abhaydaan) is the highest charity of all. Only the one, who is absolutely non-violent himself, can show others the true nature of violence. Such a being is eternally established as the Self. These are the Tirthankaras and the Gnanis.